[Jack Jones, Welsh playwright: a Mid-Rhondda production of his Mid-Rhondda Depression-era play.] Typescript of 'Rhondda Roundabout', for a production by Garrick Dramatic Society of Mid-Rhondda, belonging to Jack Heycock, who played the male lead. 'Garrick Dramatic Society, Mid-Rhondda'. Circa 1939. A satisfying association: a copy of the typescript of a play set in 'Mid-Rhondda', for a production by an amateur dramatic company from Mid-Rhondda. + 80pp, 4to. Duplicated typescript. In fair condition, on aged and worn paper. Each page is on the recto of a separate leaf. Stapled into a dark-blue card binding, with cloth spine, the front cover of which carries: '”RHONDDA ROUNDABOUT” | A Play in 3 Acts by | JACK JONES | GARRICK DRAMATIC SOCIETY | Mid – Rhondda'. Preceding the text of the play is a page carrying a list of characters and their ages, and a 'Scene-Sequence'. [John Walter Gregory, geologist and explorer.] Autograph Letter Signed ('J W Gregory') to 'Mrs. Green', explaining that he cannot accept her invitation as he must go to 'the Red Lion dinner'. On letterhead of the British Association, Oxford. 14 August 1894. 1p., 12mo. In good condition, lightly aged. He cannot accept her dinner invitation as he has 'promised to go to the Red Lion dinner & as the friend who got me the invitation there had I fear some trouble to do so, I do not like to withdraw'. The Pacific Tree and Vine (And Santa Clara Valley), 10 Orchard Street, San Jose, California. 10 May 1892. 2pp., 12mo. Very good, on two leaves of lightly-aged paper. In a difficult hand. The recipient is addressed as 'B. F. Ainger, Delegate to Editorial Committee, <?> Excursion'. The first two pages of the letter only, hence lacking Brainard's signature. Having seen Ainger's name 'among the delegates from Pennsylvania', he is 'strongly reminded of a Maj B. F. Ainger formerly of the 2nd. <?> Artillery with whom I had the pleasure of an acquaintance long ago when we were watching the Defences of Bermuda Honduras &c.
Thomas Powell, Rector of Dorstone. 12mo, [iv] + 48 pp. In original brown printed wraps. Text clear and complete. Aged and lightly worn, with slight staining to edges of wraps. 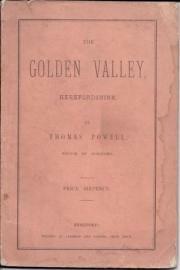 Can be dated to the 1880s, as Powell died in 1886, and the latest date in the text is 1881. 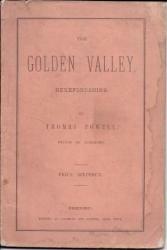 Preface: 'This little work professes to give merely a sketch of the objects of beauty and interest to be found in The Golden Valley. The Landscape-Painter, the Archaeologist, the Botanist, the Historian, will there find ample occupation. Detailed Signed Autograph Manuscript Account, entitled 'Valuation of Smithies Bridge Estate belonging to Major A. H. Baldwin'. 8vo: 12 pp. Very good, in original blue cloth account book of twelve leaves, with title on label on front board. 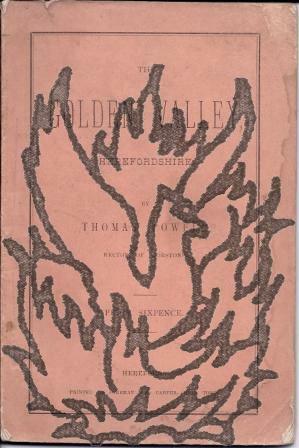 Label of Waterlow & Sons inside front cover. The entries spread across six sets of two facing pages, all ruled with red printed lines and in boxes and with the following seven categories printed at the head: 'No. on Plan'; 'DESCRIPTION. '; 'State of Cul[ivatio]n.'; 'Value per Acre'; 'Statute | A. R. P. [i.e. acreage]'; 'Value. | £ s.
3 documents, 2 printed and 1 in manuscript, relating to the foundation of the Association. All 3 items are in very good condition. Item 1 is an Autograph Letter Signed of 7 October 1910, 1 page, 8vo, from George Okell, solicitor of Ross, on his letterhead, to 'F. R. James Esq | Hereford'. He is enclosing 'circulars relating to a Landowners Society, which several Landowners in this district wish to form in the County. The main object is to assist members financially in disputes with public authorities in cases, where a principle is involved, which affects all the members'. The idea was suggested by 'Mr. No date [c.1940-1]; Sgts. Mess, Mildenhall, Suffolk. 2 pages, 8vo, both with Royal Air Force letterhead bearing the motto 'PER ARDUA AD ASTRA'. Not in good condition - creased, frayed, torn and discoloured - but a marvellous and immediate piece of history, regarding what one authority describes as the 'strategic bombing [...] principally against the Ruhr, on which No.149 concentrated during the winter of 1940-1'. The letter begins 'Dear Mum, | Just a line to thank you for the photographs, I think that one of you is very good. Typed Letter Signed to F. J. Epps, Convenor, South-Eastern Union of Scientific Societies, 78 Dunwich Road, Bexleyheath, Kent, England. 18 August 1943; on letterhead United States Department of the Interior, National Park Service. Chief Naturalist of the National Park Service and Superintendent of Yosemite National Park. One page, 8vo, slightly stained but in good overall condition. Russell is replying to Epps's request for information about the National Park System, 'particularly those areas which are classed as "nature preserves"'. He says that he is sending a number of publications under separate cover, and that with this letter he encloses copies of the 'Antiquities Act' of Congress, 1906 and 'Dr. Kendeigh's article' (neither of which are present).